The Preview settings are used to configure the way your computer and TVPaint Animation interact to play your animations, via a Proxy. You may open the Preview settings panel below via the Windows > Animation main menu. This panel is also summarized in the Info bar, at the bottom left (see lesson 01 about it). 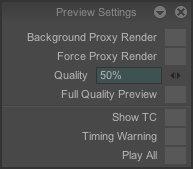 - Background proxy render : enable this option if you want the proxy calculates your animation when you're doing nothing. If you disable this option, the proxy won't calculate anything. - Force proxy render : enable this option if you want read your animation after the proxy has totally calculated your animation. If you disable this option, the proxy will calculate your animation when playing it. In TVPaint Animation, when you play an animation, ratio's quality directly depends on the temp file, located in your hard drive. The best quality will be calculated following the transfer's speed of your hard drive. - Proxy quality : indicate, with a numerical value, the images' quality when playing your animation. The more the percent is high, the more the quality is good. Check Full quality preview if you want to play your animation with the real image quality. - Show TC : enable this option if you want to see the time code (if your Timeline uses the time code mode) or the FPS code (if your Timeline uses the frame mode). - Play all : enable this option if you want the proxy calculate all images. If you disable this option, some images can be unread when playing the animation.